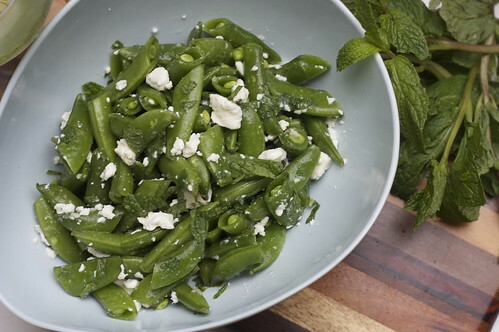 Is there anything better than a sweet, crunchy sugar snap pea? They’re one of those vegetables that I could eat a pound of without blinking an eye. I’ve been thinking about combining them with mint and feta in a salad after I was inspired a couple of weeks back. 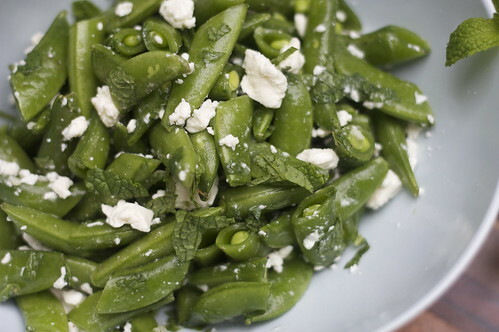 This simple recipe is perfect for spring. It’s pea season! Mix lemon juice and minced garlic in a bowl. Half sugar snap peas on a diagonal. In a bowl, toss the peas in the lemon garlic mixture to coat. Add feta and mint and toss to mix. Salt and pepper to taste. What do you make when nothing is making you feel good? I spent the majority of today laid up in bed and had to cancel my conference calls in hopes of feeling better. Now I’ll be spending the rest of tonight catching up on work and hoping the waves of nausea pass. Sounds like prime time to talk about food! I bought a couple of mangoes the other day and figured I’d better put them to good use before they got overripe. 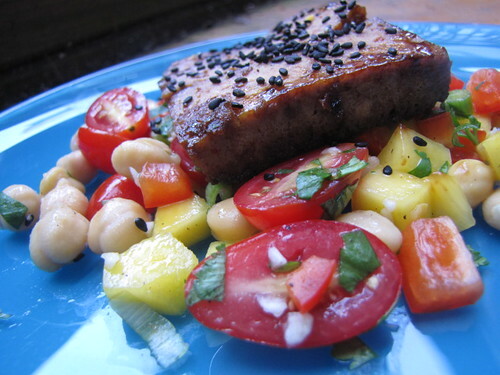 This is a similar flavor to my mango salsa recipe, but is more fitting as a summer salad. Less juicy, more filling. 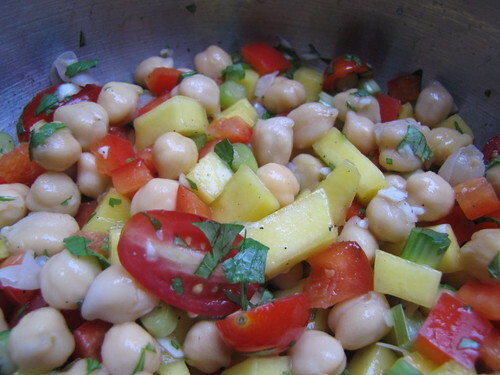 Mango & Chickpea Salad1 can of chickpeas, drained1 mango, chopped1 cup grape tomatoes, cut into halves1/2 red pepper, chopped1/2 cup green onion, chopped1 clove garlic, choppedCilantro (handful) chopped1 lime (just the juicesalt & pepper to tasteCombine all ingredients in a bowl, mix and season to taste. 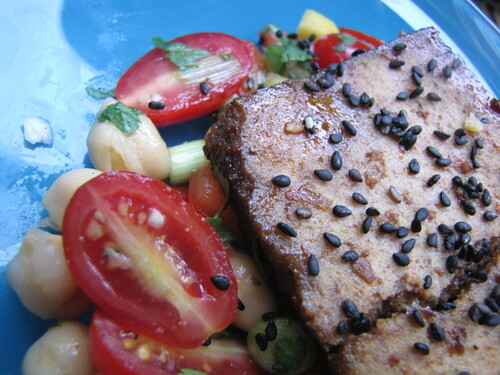 Tofu is hard to get right. I still can’t, no matter the firmness, marinade or cooking method. I keep getting back on that bicycle, and hope to conquer this beast one of these days. Firm tofu, sliced thickSoy sauceBrown sugarSesame oilGarlic powderSriracha hot sauceBlack sesame seeds (garnish)As I mentioned, I haven’t made a great tofu recipe, but this one worked. I mixed the various ingredients and marinated the tofu before cooking it in a hot pan. Topped with black sesame seeds. The combination of soy and sesame work well, but a grill would be nice. Have I mentioned my birthday is coming up? In other news, I got my passport in the mail today, so Montreal is on! Also, my new Rebel Xsi SLR will be arriving tomorrow to fufill all of my food photography dreams. I signed up for a photography workshop class at NYU this fall, so an SLR was a needed investment. Needless to say, I’m insanely excited to get it into my hands and see what sort of magic it can work. Hopefully no more having to take food photos on the dirty backsteps! Oh luxury. There is a plus though, and that is called lunch. My kitchen sits about three feet from my “office,” so it’s a cinch to whip something up between sessions of pounding away on the keyboard. No quick trips to the vending machine between emails. No crossing my fingers hoping that there will be leftover pizza after the engineering meeting. I have the world, er, refrigerator at my fingertips. 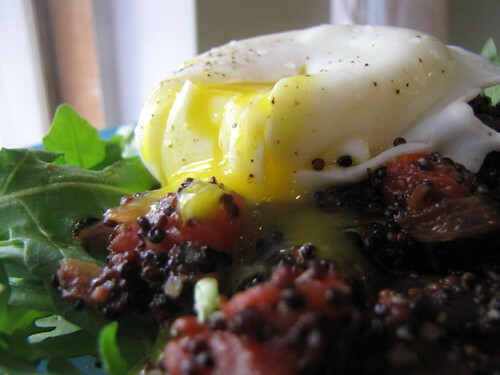 I made this salad on Monday AND Tuesday, with one major difference: the poached egg. It was exactly what was needed to make this meal complete. 1/4 cup Quinoa, cooked (follow directions on box)1/2 cup fire roasted tomato (I love Muir Glen Organic)1/2 red onion, chopped1 clove garlic, chopped1 egg2 cups arugula1 tbls olive oilsalt & pepper to tasteHeat olive oil in over medium heat and add onion, cooking until tender. Add in garlic and tomato and cook for a few minutes. Add cooked quinoa and mix. To poach the egg (I had to look up directions because it’d been so long and seems so intimidating), bring a few inches of water to a boil in a sauce pan with a sprinkle of sauce. Reduce heat to a simmer. Crack egg into a cup (this helps ensure you don’t break the yolk when you add the egg to water.) Add egg to simmering water. Cook for about 2 minutes for a runny yolk. 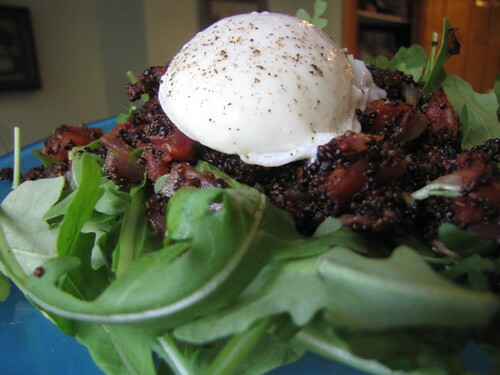 On a plate, pile with arugula and spoon quinoa mixture over top. Add poached egg and sprinkle with salt and pepper. Between the quinoa and the egg, this salad is packed with protein and is seriously a snap to make. I might have to go for round three today.